Occasionally, I put together ridiculously expensive "dream" systems—computers worth as much as a car that feature multiple high-end CPUs, dozens of terabytes of storage, exotic cooling solutions, or enough GPUs to run flight simulators on five monitors at high framerates. These computers are a real treat to build, but they are not at all mainstream. While others have different ideas about what constitutes the upper end of the mainstream DIY PC market, generally speaking, $2000 represents a reasonable threshold. Past this point, returns for increased investment decrease very rapidly, such that they are justified only by niche use—or glorious indulgence. In our recent midrange buyer's guide, I outlined three systems: a less expensive general use system capable of lighter gaming, a $1000 gaming box, and a $1200 work-oriented PC. In this guide, I detail three more systems, each around $2000 in cost. First up is a $1900 small form factor (SFF) home theater PC (HTPC). If it weren't for the anomalously high prices of hard drives at the moment (and for the near term future), this system would be much less expensive. 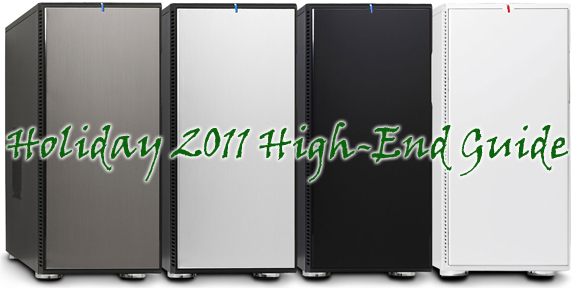 However, high hard drive prices are a reality, and thus, this HTPC is now at the high end of mainstream PCs. Second, we have an $1800 gamer that is substantially more capable than the $1000 gamer in the midrange guide. Finally, because we eschew the fastest GPUs, we're able to bring you a productivity PC that features a higher-than-mainstream CPU—the less expensive of Intel's newest six-core Sandy Bridge-E chips. In the midrange buyer's guide, I emphasized my confidence that those systems will likely remain enjoyable to use through 2016 for a number of reasons. The systems outlined in this guide are even more powerful. While I hesitate to speculate about the computing world past 2016, but I am confident that the three computers detailed in this guide will probably remain relatively capable for another five years—delivering more than acceptable and even enjoyable experiences. If you buy at the high end, there's probably a reason for it, so very likely you'll upgrade before five years have passed. Even so, with computer performance requirements leveling out, you can always sell a still-fast PC or give it to a friend/family member. Perhaps the most important thing to keep in mind when designing and building a $2000 PC is to have fun and enjoy it! Any reasonable enthusiast would be more than happy to use any of the systems outlined in this guide. So without further ado, the next page starts with a system that packs a powerful CPU and lots of storage space into a small chassis. I really like the upscale HTPC build. I've been wanting an InfiniTV quad for quite some time now, but I've been told it won't work well with my cable provider (by one of their technicians). The technician was lying to you.